Heavenly blog! : No. 727: Israel - the land and people that can not stand to lose a war before they had been wiped out and removed from the map and would have ceased to be a people of a country! No. 727: Israel - the land and people that can not stand to lose a war before they had been wiped out and removed from the map and would have ceased to be a people of a country! Israel - the land and people that can not stand to lose a war before they had been wiped out and removed from the map and would have ceased to be a people of a country! The coverage of what is happening in the Middle East is very influenced by denigrating Israel, and lifting up the Arabs. At bottom, this is an agenda of Satan, the fallen angels and demons behind scripture says: Eph. 2 2 You lived in them in the current world view and let you lead the ruler of the skies, the spirit that now worketh in the disobedient. 3 Yes, we all lived once they. We followed the lusts of our own flesh and blood, and let us be guided by it and by our own thoughts. We were by nature children of wrath, we as the others. 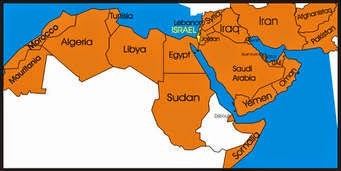 Image of the Arab countries Israel is surrounded by. Israel is surrounded by Arab states that Israel can never depend on whether they have signed a peace treaty with Egypt. Had Egypt or other Arab state believed and felt strong enough, they had gone to war against Israel spur immediately. In other words, the conflict in the Middle East is a conflict between God and Satan. Without understanding the spiritual accept this conflict between Israel and the Arabs and the world community. So you will not get the right understanding of this. Here fragments of an article by Brett Halsne. Israel is a democratic country with a democratic government as opposed to Hams that are totalitarian and pro-Muslim! Israel is a country and a people who share our values ​​and who struggle to live with these values ​​in a corner of the world where this is just a distant dream. But we have turned them back. For us, the evil become good. How did we here? The war in the Middle East rages on. Death toll rises among Palestinians, but despite the fact that Israel agreed to a ceasefire proposal by Egypt on July 15, there is nothing to suggest that the attacks will cease yet. Since then known as Israel began a ground operation in Gaza, and peace seems to be far away. Wednesday July 16, Stavanger Aftenblad an article about the conflict where the heading is as follows; "West Bank leaves peace struggle to Gaza." The article is interesting in several ways, but I will first comment on the headline. For such a headline show us how the aftenbladet.no and several of them, looking at the conflict between Israel and the Palestinians; Hamas runs a peaceful struggle. Against Israel. The rockets are sent inward Israel in the service of peace. It's like when we bombed Libya, and freed people from the tyrant Gaddafi. Or as the resistance during World War II. A resistance and struggle that was necessary because we believed in the good, and freedom. We had in fact right. We fought for the good. The same now applies to Hamas. Same thing. But how did we here? What has happened since evil has now become good? For Hamas is not for the good. Let's be very clear. They are a terrorist movement that does not share any of our values. They account for almost the exact opposite of what we do. Former Norwegian Mideast negotiator, Minister and Deputy Secretary General of the UN, Terje Rod-Larsen, the following characterization of Hamas directly on Dagsnytt Eighteen NRK P2 on July 15; "... It is a tyrannical regime that is oppressive, it does not respect human rights, there are summary executions, repression of women, minorities such as Christians suppressed etc." correspondents in the Middle East, Sidsel Wold, said during the same broadcast; "... I do not know if Hamas is so concerned about its population really." Gaza is not occupied by Israel. The Palestinians gained full control of Gaza when Israel withdrew in 2005. Yet we hear all the time that it is "occupation" that is the clear cause of the conflict. Since Gaza is not occupied, one must then consider that it is the occupation of the West Bank is the cause of the conflict in Gaza. But here is something strange. For the West Bank, for the whole world does not become involved in the conflict between Israel and Hamas. Why? Majd Shuman answer Stavanger Aftenblad July 16 that they have it well thanks to the Palestinian Authority actually collaborating with Israel. So while Jonas Gahr Støre, Heikki Holmås, Mads Gilbert and Sidsel Wold with many more argue with the occupation of the West Bank as the cause of all conflict, responding Shuman that they have it well in the West Bank. Should we believe the argument that the occupation of the West Bank is the cause of the conflict must mean that Hamas has not brought with him the answer to Shuman and the West Bank. For they have it good. The conflict in the Middle East is a tragedy for all victims. It is a tragedy for Gaza and the Palestinians. It is a tragedy for Israel. At the same time the way we even looking at the conflict that something has happened to us. A terrorist movement and a tyrannical regime called Hamas has led us to turn against Israel. Israel is a country and a people who share our values ​​of freedom of speech and religion. It is a democracy with a rule of law where everyone is equal before the law. Israel is fighting for his life with these values ​​in a corner of the world where this is just a distant dream. Where women, gays and minorities are systematically oppressed and where Christians are being executed. But we have turned them back. For us, the evil become good. Psalm 83 1 A Song. A Psalm of Asaph. do not be quiet and silent, O God! Those who hate you, lift your head. they take counsel together against those you cherish. that the name of Israel will no longer be remembered! " and a strong arm to the sons of Lot. as to Sisera and Jabin at the Kishon River. became as dung upon the ground. All the officers who Zebah and Zalmunna! 13 For they said: "We will take God's pastures possess." as the stubble before the wind! and scare them with your gust. then they ask for your name, O Lord. let them be disgraced and perish! This conflict that we see now in the Middle East is not new, but is several thousand years back in time. The aim was, is and will remain the same. They can hate and lie in civil war and strife, but a common goal united them before, and now today. Annihilation and destruction of the State of Israel, the people and everything they stand for and represent!